This is Edward (Eddie) Song, the owner of Korilla BBQ, a fast casual restaurant that strives to advance Korean cuisine through innovation. Eddie’s entrepreneurial aspirations began in 2008 when he was graduating from Columbia University in the midst of the Great Recession. There weren’t many job opportunities available so he thought it was a better time than ever to be your own boss. However, unlike many entrepreneurs in the food industry, Eddie’s interest in the hospitality/restaurant business didn’t come from a strong focus on food throughout his childhood. He, like many other people in 2008, was looking for the safety and comfort that was lacking in the midst of the financial crisis and started thinking a lot about what made him feel comfortable and safe. He immediately started reminiscing about going out to eat on the weekends with his family, which, because everyone was so busy, was the only time they had to get together and catch up. So he decided to open a food business that could fill the need for comfort in others as it did for him. He enrolled in a free four month culinary program offered by Kingsborough Community College in conjunction with The Restaurant Opportunities Center United but quickly realized that he wasn’t a good cook. So when everyone else in his program began thinking about specializing in baking vs. cooking and interviewing at restaurants, he started thinking about food concepts. After trying out a bun concept that never took off (the idea was to take the Chinese pork bun and make it more internationally appealing), he began realizing that there weren’t many restaurants focused on creating Korean food. Of course there were communities throughout New York where you could find amazing Korean food but it wasn’t as widely represented as he believed it should be. So he decided to take Korean food and make it more mainstream and readily accessible to the American public through the Korilla BBQ brand. Korilla BBQ started as a food truck with a menu that Eddie says came through a “series of fortune events”. He wanted Korilla BBQ to represent the aspects of Korean food that he loved as well as the other foods that he and his siblings grew up eating. Growing up in Queens, there were many cultures on a single block so mixing Korean food with Mexican and hints of Southern BBQ and American fare seemed very natural to Eddie and he was able to find a chef who understood his concept. Although the chef was Japanese, he was also from Queens so he had grown up eating Korean food and was familiar with the flavors that Korean food is known for. They began pulling their favorite elements of dishes (proteins, flavors, textures) from Korean food as well as other cuisines, visiting Korean restaurants that Eddie liked and seeing how they could make their items better. Then Eddie got lucky and met a Korean restaurateur who owned a quintessential Korean restaurant in Flushing that was extremely popular. He liked the concept that Eddie was working on and allowed them to observe and work with his chef to learn how to make all of the best Korean foods that they had grown up eating. Through their own research and the help of this restaurateur, they were able to cobble together their first menu, mixing the recipes that they had been taught and the ones that they had reverse engineered. Once the menu was created, Eddie was able to officially launch the first food truck in October 2010. He believed that the food truck would be the best way to bring their food directly to their customers and for the next three years, they were very successful. At one point they even had four different food trucks operating at the same time. However, in 2013 a lot of new food trucks began opening, increasing competition and aggravating restaurant owners with brick & mortar locations. They began complaining that food trucks were stealing their customers and blocking their store’s visibility and the police started getting involved to help resolve the issue. However, this meant that they would keep food trucks from parking in their usual spots on the street or they would make them move, typically during their lunch rush when it was impossible for them to shut down, move and find another parking spot to sell from. This started happening consistently enough that Eddie realized that he needed to accelerate their transition into a brick & mortar location. They opened their first location in the East Village in October 2014 and replicated the same “build your own” experience that they had on the truck inside the store. They also extended their trademark Korilla orange and tiger stripe motif from the truck to the store design. Eddie chose a tiger as the symbol for Korilla because it’s the national animal of Korea and it’s also very reflective of the food’s bold, fierce flavor. He kept the coloring of the trucks and stores bright and eye-catching to make sure that they stood out and enticed people to walk up to the truck or into the store and see what they were offering. Every location that they’ve opened since the flagship East Village store incorporates the same color palette and tiger motif but each one has it’s own layout. Eddie says that this was done on purpose because each store is an evolution of what he thought Korilla was at that moment in time, giving each location it’s own unique personality. For Eddie, the most rewarding part of the business has been introducing others to Korean food. One of Korilla BBQ’s core mission statements is to advance Korean cuisine and to create more awareness of the 5,000 year old history of Korean food through the Korilla brand. So seeing customers come into the store who have never tried Korean food before and fall in love with the rich flavors and unique taste validates his mission. He believes that he is a part of a larger movement to take Korean food, which he saw as a relatively obscure cuisine in 2008, and bring it to the forefront of the food industry. 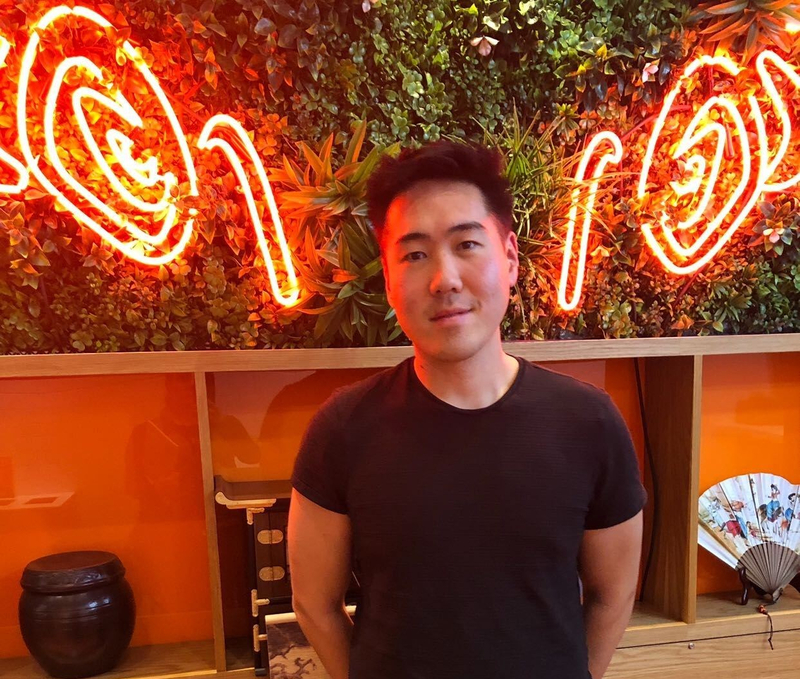 Since the majority of Koreans started emigrating to the U.S. in the 70’s and 80’s, including his parents, Eddie sees the elevation of Korean food as his generation’s job. He recognized that no one was pushing Korean food into mainstream American culture not because it was a bad idea but because the only people who were able to do it were people like his parents who were working tirelessly to support their families. Therefore he’s trying to make Korilla BBQ a lifestyle brand that revolves around this movement and hopes that people can think of Korilla as a symbol for change, creating for them a sense of inner confidence and boldness, with which they can attack any situation. However, creating such a strong brand does have challenges, especially when it requires every person in the business having the same zeal and passion for the brand that he does. Eddie is constantly striving for perfection and always wants to provide an A+ experience to his customers every single time. But at the end of the day, he’s ultimately relying on other men and women to provide that experience, which due to so many external factors, may not always reach that expectation. So dealing with the variability of a food business can be very difficult as an owner. Right now Eddie says he’s still in the process of creating the perfect blend of all four values that he believes are key to a successful business: quality, taste, speed and price. There are a lot of people that he sees in the restaurant industry that are willing to make value sacrifices and trade-offs to keep price low or sell food faster but he doesn’t believe in doing that. Which is why he advises other entrepreneurs to understand that what determines your success is what you’re willing to do or not do and as hard as it gets, you can’t give up, you have to keep on trying. In the food industry especially, you have to be passionate and determined enough that even if you keep getting the same results every single day, you can keep pushing to make it to the next day, the next chapter, the next year, because eventually you will get it. He also advises that every business owner has to be his or her own cheerleader and allow themselves to celebrate small victories. For Eddie, it’s the small victories that feed his passion and motivate him to keep moving forward. Previous Entry:DIY Game Day Snacks!